Famous for creating gorgeous “look at me” eyes, style-maker and celebrity makeup artist Mally Roncal (Beyonce, Jennifer Lopez, Angelina Jolie, Rihanna, Mariska Hargitay are fans) brings you expert picks for sultry summer eyes – and cheeks, and lips! Mally's advice for an easy beach-bound makeup look: Slather on the SPF everywhere! Curl your lashes and coat with waterproof mascara to avoid runaway eye makeup. Give definition to your face with a waterproof brow pencil. Peach is the new pink and that goes double for lip gloss…try Mally Beauty Lip Gloss in Be a Peach or Mally Beauty High Shine Liquid Lipstick in Summer Peach. Don’t skip concealer or you’ll look tired. Mally Beauty Cancellation Conditioning Concealer SPF 25 is the perfect summertime option. I tried Be a Peach and love it. It's the perfect beachy shade in a super-smoothing texture. I have yet to leave home without it this summer. 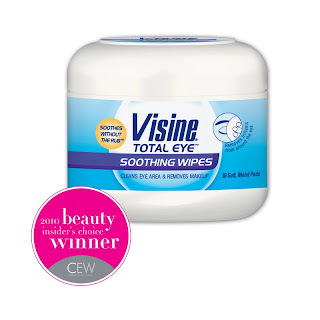 Molly also recommends using VISINE® Soothing Wipes as a great product to use at the end of the day. Before you wash your face, gently remove eye makeup (even stubborn waterproof mascara!) with VISINE® Soothing Wipes. Store them in the fridge for an extra-cool, refreshing treat. They really revive tired eyes and feel refreshing after a long day outdoors. They're are also great to stash in your bag for all your summer weekend getaways. For more info on Molly's beauty looks, go to www.visine.com.